With Silent Loop be quiet! 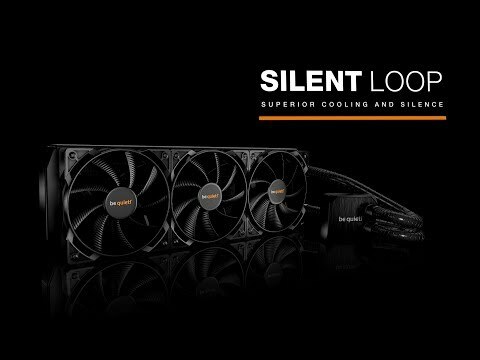 brings whisper-silent technology to the world of All-in-One watercooling, making liquid cooling an attractive option for those who want to overclock CPUs for maximum processing performance or cool high-power PC systems. Thanks to its decoupled reverse-flow pump, Silent Loop works ultra-quiet and with practically no vibration. It comes in a premium all-in-one package designed for maximum compatibility and installation flexibility. • Innovative decoupled reverse-flow pump provides low-noise operation with less vibration. • Thanks to the technique “reverse-flow” the pump draws the liquid coolant from an outer cavity of the pump housing across the base plate and discharges the warmed liquid coolant through a second level inside. • Two Pure Wings 2 120mm PWM fans include an array of optimizations for quiet airflow. - High-quality rifle bearing technology contributes to a long lifespan of up to 80,000 hours. - PWM speed control function allows for optimum balance between quiet operations and efficient cooling. • Full copper radiator maximizes heat transfer for peak cooling performance. • Nickel-plated coldplate allows the use of heat-conducting metallic paste, thus improving heat transfer and overall cooling efficiency. • High TDP rating supports overclocked CPUs and demanding systems. • Increased air pressure thanks to a highly efficient blade design of the two 120mm Pure Wings 2 PWM fans, making these fans the perfect partners to work with the radiator. • Flexible bend- and pinch-protected tubes take the worry out of routing supply lines. • Small and thoughtful heat exchanger design supports full use of RAM slots. • Refill port extends the product’s useful lifespan and promotes silent operation. • Compatible with Intel® and AMDTM sockets. • Convenient radiator mounting is compatible to most case designs. • Quick support is available via our international hotline, Mondays to Fridays from 9:00am to 5:30pm CET: +49 (0) 40-736 76 86 - 98. Features • All-in-One water cooling provides everything you need in one package. • Innovative decoupled reverse-flow pump assures excellent cooling efficiency with whisper-quiet operation. • Two Pure Wings 2 120mm PWM fans feature airflow-optimized fan blades and variable speed operation. • Refill port and flexible bend-protection tubes extend the product’s life span and promote easy handling. • Compatible with Intel® and AMDTM sockets, and sized to permit full use of RAM slots. Be quiet! 120mm Silent Loop Ultra Quiet All-in-One Hydro Cooler, 2x 120mm Pure Wings II PWM Fans, Copper Rad, 2066/AM4 is rated 4.0 out of 5 by 1. Rated 4 out of 5 by Chris18 from Good cooler, but can be loud This is the first all-in-one water cooler that I've tried. If you run the fans at full speed, it is pretty noisy, and I don't think the fans are exceptional. I've only been running this for a few weeks, but the pump seems silent. It's hard to judge the cooling, as I think the processor I've got is quite hot, but it seems effective.